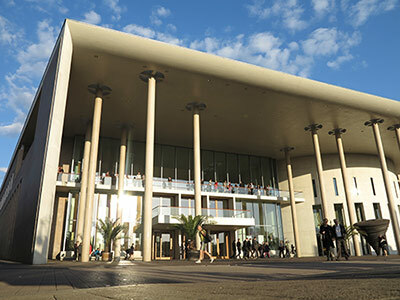 The Konzerthaus Freiburg, the main congress venue, is within an easy 5-minute walk from the center of Freiburg and only 2 minutes from the main station. Equally the Novotel Hotel and the University building (KG I), where congress scientific sessions will be held, are in the immediate vicinity. The Konzerthaus (Concert Hall) Freiburg will be the venue of the IUFRO 125th Anniversary Congress. Since its construction in 1996, a vast number of meetings and cultural events have been held in this large, modern building located in the city center. State-of-the-art technology enables the space to be modified to meet the needs of this Anniversary Congress, while the natural lighting and high ceilings in the interior add to the appeal of this venue. Technical sessions will also be held in university rooms within a short walking distance. Due to the widespread public transport network system and the central location of the Konzerthaus, congress participants will be able to reach the venue easily by train, tram or bus, on foot or by bicycle if they wish. The central location of the congress venue means participants will have opportunities to stroll around Freiburg and experience the many facets of this medieval yet modern city with its thriving economy and young multicultural community. The Black Forest to the east and the Rhine Valley to the west are within reach by public transport for those wanting to travel further afield. The Novotel is connected with the Konzerthaus, please access the congress rooms of the Novotel via the Konzerthaus. 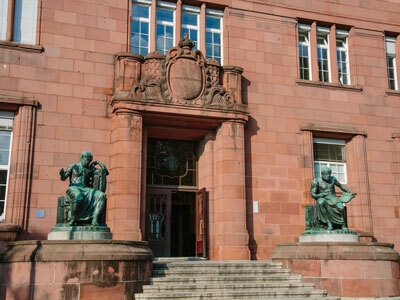 The Kollegiengebäude I (KG I) of the University of Freiburg is located in the heart of the old town and only some walking minutes away from the Konzerthaus. The Kollegiengebäude II (KG II) of the University of Freiburg is located next to the KG I. By foot: From Konzerthaus/Novotel 5 minutes along the Bertoldstraße, after the Theatre turn to the right. The KG I is located opposite of the glassy University library. Take tramways 1 (Littenweiler), 3 (Vauban) or 5 (Rieselfeld) – to tram station “Stadttheater/Universitätszentrum”. Then turn to the right. The KG I is located opposite of the glassy University library. By car: Motorway exit “Stadtmitte” or “Universität” to Werthmannstraße – Rempartstraße.